Over the past quarter century, MultiSoft has frequently been called upon, often times at the very last minute, to assist with the launch of new companies and to help rescue faltering companies by helping bring them back to profitability. Our team of seasoned professionals often perform complete “face lifts” on the image and missions of companies, enabling them to positively stand out in the highly competitive network marketing industry. Continuing on this tradition of excellence, we also provide consulting and support services to existing and start-up companies in the areas of: business forms, graphics and illustration, legal issues, referrals, company “roll out”, “pre-launch”, “fast start programs”, compensation plan development, national and international expansion, distributor training and much more. Beyond administration, we are highly familiar with the distributor experience. Experience on both the administrative and distributor sides of MLM has provided us with the opportunity to learn how to craft solutions that serve both groups successfully without compromising one another. MultiSoft’s many years as the premier MLM solutions provider, ensures that you are receiving the highest quality consulting possible. When you need experience and dependability, you need MultiSoft. 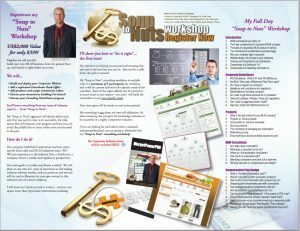 We are confident that you will benefit from an association with the best MLM Workshop available. . . anywhere, at any price! Our team has been servicing the direct sales and MLM industries for over 25 years. We have experience in the industry from the distributor, company owner, vendor perspectives. We provide turnkey products and services to the industry. We use our own products and services to illustrate the concepts reviewed. Our goal is to make your dream a reality! We will show you hands-on how it is done. Our approach will clearly define each step that you need to take to be successful, the milestones that will measure your progress and how you can avoid the pitfalls that so many others have encountered in the past. Let us show you how to “do it right”… the first time! Our interest is in helping you succeed and ensuring the next generation of MLM owners is the best that it can be. Join us for a walk down the path to success! Our $399 MLM Workshop is custom tailored to your specific needs. Each of the topics offered can be covered in as much detail as YOU require. Our workshop is not about our own self-edification; it’s about ensuring that you gain the knowledge necessary to become successful. 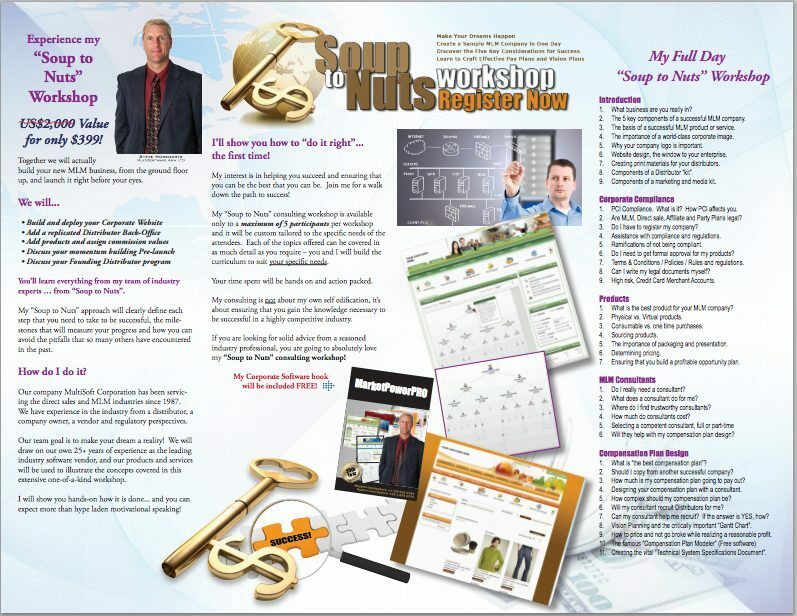 If you are looking for solid advice from a seasoned industry professional, you are going to love our MLM Workshop! Let’s get started… the following is a summary of our available units. What are they and why must I have them? Where do I find this material? What are the consequences if I don’t have them? Are MLM, Direct sale, Affiliate and Party Plans legal? Do I have to register my company? Do I need to get approval for my product? Terms & Conditions / Policies / Rules and Regulations. What do these mean to me? Can I write these documents myself? Can you provide me with standard forms? Do I really need to retain an attorney? What is the best product for MLM? Should I copy from another successful company? How much is my compensation plan going to pay out? How complex should my compensation plan be? Does my consultant recruit Distributors for me? Can my consultant help me recruit distributors? If the answer is YES, how? ASP or self hosted, what does it really mean to you? What does MLM software do for the company and the distributor? What features will I need? Will I need custom programmed software? How much does MLM software cost? Do I need to hire an IT expert? Where can I use my software? So, you want to sell around the world! A global presence, is it important? How do I sell in multiple currencies? Who pays the commissions to my Distributors? What payment methods can be used to pay Distributors? What about hiring my own programmer and building it myself? My friend said it is easy, is it? I can do it cheaper with offshore programmers I will never meet??? Should I have a Founders Program? I have my new company, now what? No one visits my website, what can I do? Why is my website not ranked on Google? Who can help me get traffic to my website? How do I recruit new distributors? Should I place ads in newspapers and magazines? Where is the best place to find customers? Should I pay to entice leaders (aka Heavy Hitters)? Where do I advertise my product to get the most sales? I signed up a few friends but no one is selling or recruiting, why? Do I need a big fancy office and a swanky car? Who will handle all of my support needs? Who do I call when I have questions? Do Distributors really know your compensation plan and products? What Distributors can and more importantly cannot say about you and your products and compensation plan can definitely get you in hot water. Create certification courses yourself and train your distributors like no other company! Experience TrainerWare at: www.trainerware.com.